An update on your friendly neighborhood Open Source Hardware Association. In case you've missed it, we really like open-source around here. Because it's such an important value to SparkFun, I have permission today to take off my SparkFun engineering hat and wear my Open-Source Hardware Association member hat. Back in October, I was lucky to be elected to the OSHWA board. Since the Association received its non-profit status, the Board is finally able to begin increasing its reach in the community. Many new initiatives are being discussed and we've been collecting a lot of community input on what is needed in the open-source hardware world. One of the main objectives the Board has in mind for the next year is to continue building up the community interaction and awareness of the association. Recently, there's been a lot of activity on the mailing list, which is very exciting to the Board. The community is stepping up and getting involved, discussing various topics such as hardware projects and whether they actually qualify as "open-source hardware," as well as planning a meet-up to work on improving the development of open-source CAD programs. There is also great movement from the community on working toward an open-hardware repository to be a resource for all open-source hardware users, hackers, and creators. If you would like to contribute to these efforts or would simply like to learn more about what is going on in the open hardware community, please join the mailing list. Alternatively, if you'd like to have a direct say in the activities of the association, please consider becoming a member. Keep in mind many companies offer donation matching, so you can potentially stick it to the closed-source man by donating and having your company match it! Another exciting development is how many groups and companies are beginning to reach out to the Board. We recently heard from the Open Source Circular Economy Days, and are excited to see other groups are not only embracing the concept of open hardware, but also working diligently to encourage the use and development of open hardware in their individual communities. Do you know of an event or organization that is helping champion the OS hardware movement? Let us know! Or, for local community groups hoping to get more involved, please consider becoming an OSHWA branch. An additional point of excitement was the release of the book Building Open Source Hardware. 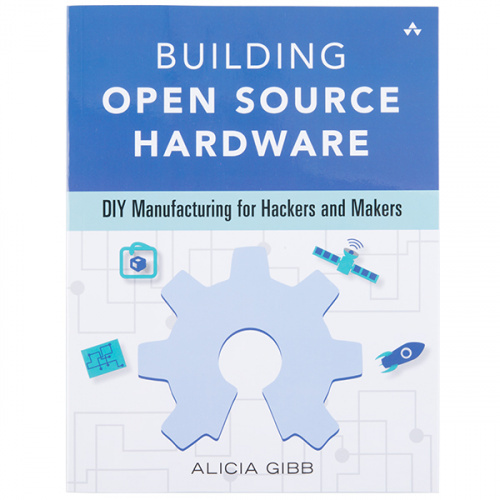 This book is a great introduction to the development and manufacturing of open source hardware, and proceeds from the sale of the book go back to supporting the association and its outreach activities. Finally, the Board has also been working diligently on preparing the 2015 Open Hardware Summit. It is going to be held in the US this year, as our experience last year taking the Summit international unfortunately left the budget much leaner than expected. Keep in mind that if you become a member of the association, you also receive a discounted ticket to the Summit! As always, the Board wants to hear from the community about what we can do to improve the open-source hardware experience. If you have suggestions, concerns, complaints, or issues, let us know! We'll continue incorporating your input and working toward making open hardware the standard, not the exception. Congratulations (belatedly) on being elected to the board! We are looking forward to many new and exciting developments. Just to make sure folks are not reinventing the wheel, talk to the folks over at Mach30 (mach30.org) regarding their work with FreeCAD, CadQuerry, Open Design Engine, and MTK/Sage/Python/LaTeX integration. Even if Mach30's path is not the one you wish to go down, there are many lessons learned, available for the low, low price of a conversation, which can save OSHWA time and resources. That's great information. Thanks for the feedback - it will be useful. It is all very very interesting. I would like to see an analysis of the tradeoffs between development cost, sales margins, and viability of Open Source. Some linear programming with simple models is a good place to start. Anyone looking into this? I have no problem with OSH on 2 layer boards. 6 or 8 layer with lots of features and circuitry and testing and software dev time? Not so sure I want to give that away until some costs are earned back. Is there a proposal for something like "OSH starting 18 months after first release"?